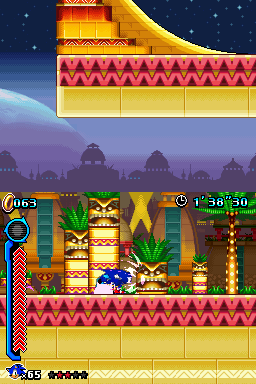 Tropical Resort is the first stage in Sonic Colours (Nintendo DS). This Eggman hotel resort resembles a glitzy, orbital Vegas. Fireworks, neon signs, and huge golden buildings crowd the backgrounds. Although it shares the setting with Tropical Resort (Wii), this DS counterpart stage has a glider section and the "Burst" power to use. Sonic and Tails ascend Eggman's Ultra-Accelerating Space Elevator (as later seen in Terminal Velocity) to explore Dr. Eggman's Amazing Interstellar Amusement Park before it opens to the public. Sonic is convinced that Dr. Eggman must once again be up to his evil tricks, no matter how much the intercom assures that "this park is constructed entirely out of a sense of remorse for my previous transgressions, and is in no way associated in any sort of evil plot or premeditated misdeeds". While there, they run into Cream the Rabbit and her Chao Cheese, who has been mistaken by Orbot and Cubot for a Wisp. 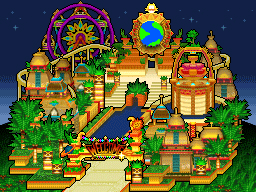 The Tutorial Stage in the DS version of the game takes place at Tropical Resort. Tails walks the player through basic functions such as running, jumping, sliding, stomping, the Spin Dash, and the Wall Jump. Tropical Resort Act 1 on the DS is where Sonic and Tails first run into Yacker and the White Wisps, chasing away Orbot and Cubot, who are looking to capture them. The level itself fairly straightforward and encourages the player to use the basic moves from the tutorial. Near the end of the act, there is a 3D hang gliding sequence in which the player can move around to avoid obstacles and collect rings while gliding. There are more areas to explore here after unlocking the White and Red Wisps. After a short tutorial, act 2 is more or less the same as act 1, this time focusing more on the Sonic Boost. To clear Mission 1, Sonic must collect 30 White Wisps within one minute by defeating badniks or destroying Wisp capsules. After the mission, Cream explains that she mistook the space elevator for a ride and traveled up to the park with Cheese. Mission 2 takes place in Tropical Resort Act 2. It is a Time Trial in which checkpoints will increase Sonic's remaining time. To clear this mission, the player must reach the goal before time runs out. To clear this mission, Sonic must collect 250 rings within a minute and a half. This page was last edited on 8 April 2018, at 09:46.